Dubai Parks and Resorts, the home of Motiongate, Bollywood Parks and of course Legoland, will become home to the Middle East’s first Legoland hotel in 2020. The hotel, which is set to have 250 lego-themed rooms, will feature a castle play area and a disco elevator within the resort. Set to open in the first half of next year, a first-look render has revealed a candy-coloured exterior surrounded by perfectly manicured lawns. The UAE currently has two Legoland theme parks – Legoland Dubai and Legoland Waterpark, both destinations are designed for families with children aged between two and twelve. Split into five main sections – Lego City, Imagination, Kingdoms, Adventure and Miniland – Legoland Dubai has more than 40 different rides, from hair-raising (and fire-breathing) roller coasters to glow-in-the- dark interactive adventure quests and Kid Power Towers, where children can hoist their parents up in the air. Legoland Dubai will join destinations such as Malaysia, Denmark and California, becoming the seventh Legoland hotel to open around the world. 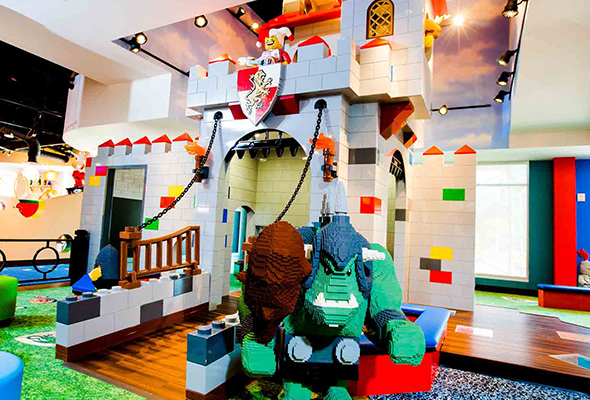 All of the hotels have an array of different room themes from castles to medieval to pirates, with creative structures built with lego blocks. The Legoland Hotel Dubai will be a joint venture between DXB Entertainments (who look after Dubai Parks and Resorts) and Merlin Entertainments Group who will manage the property’s operations. Dubai Parks and Resorts aims to expand its accommodation offering over the next year. “We will have more than 1,300 hotel rooms available by 2020, as the Rove Hotel opens during 2019 and Legoland Hotel opens in 2020,” said Mohamed Almulla, CEO and Managing Director, DXB Entertainments.